It’s Pie Week on this little corner of the internet. 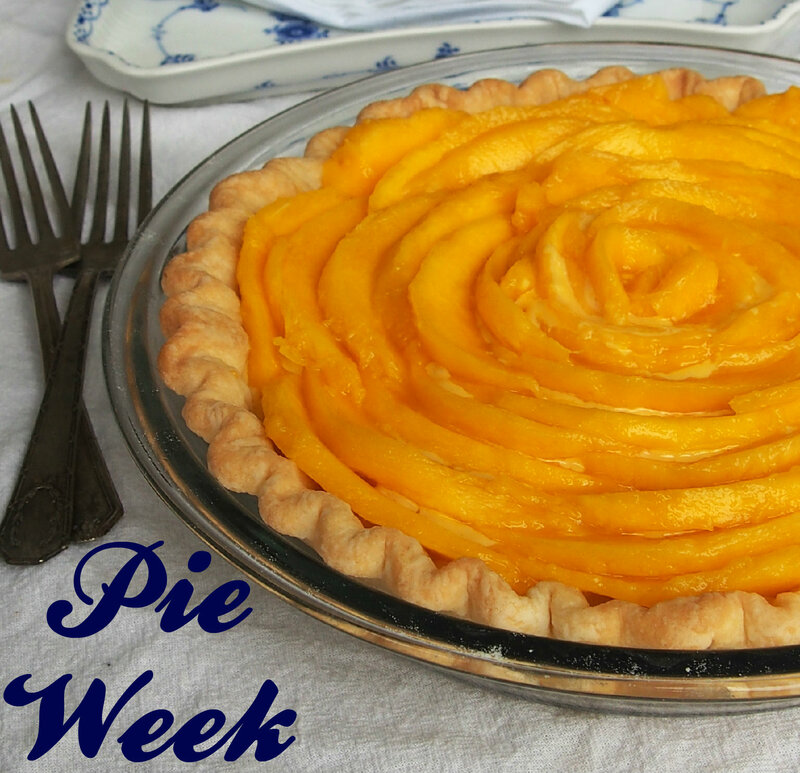 We did a similar Pie Week last year and it was so successful, we decided to do it again! Plus, who doesn’t need more pie? As of this week, it was 90 degrees in California, so baking a toasty warm apple pie seemed out of the question. 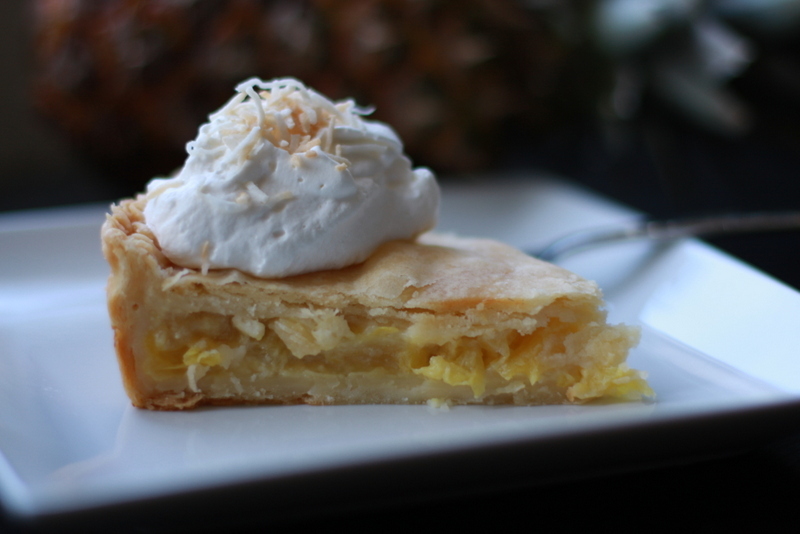 I decided to get a bit more tropical and try making a pineapple pie, which I had never tasted before. Disclaimer: It turns out I don’t like pineapple in a pie, but my four taste-testers disagreed. They loved the pie and told me I needed to put it up on the ole blog. The recipe was very simple to put together. I used Kirsten’s fail-proof “No Excuses Pie Dough” recipe for the crust. Her recipe takes approximately 5 minutes to throw together and it freezes beautifully. That recipe single-handedly helped me conquer my fear of pie-making. Now that I know how simple it is, I want to make pie every day. Plus, the filling came together in no time at all. Step 1: Beat together butter, sugar, eggs, and vanilla. Step 2: Stir in pineapple, juice, and corn starch. Step 3: Fill pie crust and cover with second crust. Step 4: Crimp the edges of the pie with your fingers or a fork. Cut 4 small slits in the pie crust. Step 5: Bake at 350 degrees for about 30 minutes or until crust is golden brown. I topped mine with a simple whip cream and toasted coconut. To toast the coconut, simple heat shredded coconut in a pan over medium low heat until lightly golden brown. 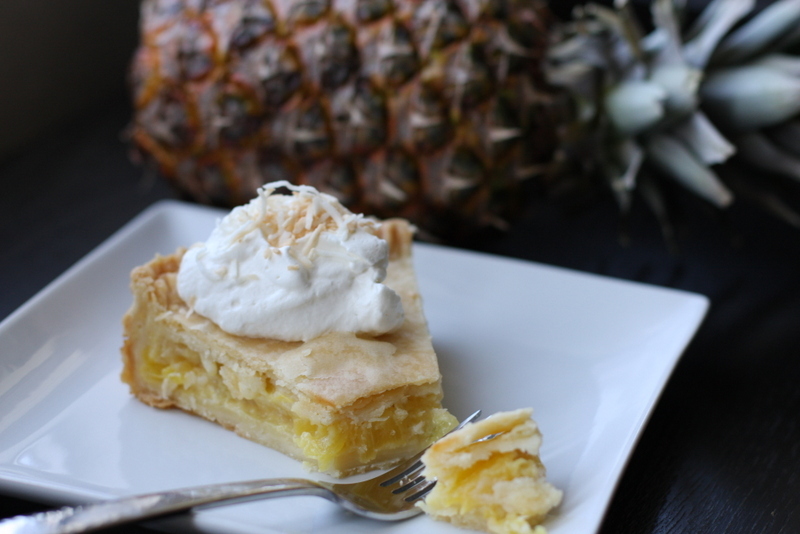 Have you ever had pineapple pie? What is your favorite tropical pie? This entry was posted in Uncategorized by Mads. Bookmark the permalink. Mads, if we get more baby pineapples next summer (fingers crossed), I’m using one of them to make this pie. It looks fantastic! I love the double crust, but then I’m always for more crust. Yum! I have never had a tropical pie before and definitely not pineapple pie! Next summer when the pineapples return to my small grocery store, I’m totally going to try this! I think I would love this pie, in fact I know I would!!! Taste testers can’t be wrong! Your pie looks delicious! I love how bright and summery it looks. I’m pinning this recipe for when I’m sick of snow and need something tropical. This looks great! I think it will be served in my neck of the woods very soon. A pie is one way i haven’t tried pineapple yet! Thank you. And ALOHA! I like this Tropical Pie Tuesday!! Between you and Mon, I’m losing my ish over these!! Soooooo…..how I have I lived on the planet for 30 years and never had a slice of tropical pie!! Clearly that needs to change. Pass me a slice? I make pineapple pie in the winter….with crushed pineapple thickened on the stove with a little sugar and a little nutmeg, maybe a little lemon extract and a little melted butter. I pour it into a pre made pie shell and bake about a half hour. I like it.